Kartotrak is the first all-in-one software solution designed for an efficient characterization of soil contamination. It has been conceived for all those in charge of environmental site assessment or remediation who need to locate and estimate contaminated soil volumes confidently. Kartotrak offers an integrated workflow that streamlines the characterization process and can be used at any step of a remediation project: during the scoping and the characterization phase or after remediation to verify site compliance with cleanup regulatory rules. A light version of Kartotrak, Kartotrak.one, is available for those who only need data QC and rapid contamination mapping functionalities. Because you need to be confident with data quality in order to produce reliable results, Kartotrak offers high-value exploratory data analysis tools for an in-depth quality control. Its integrated Geographical Information System and 3D Viewer help you improve your contamination knowledge and identify key uncertain areas. Kartotrak is very easy to handle and its workflow guides you through each step of your project, simplifying software manipulation. Once parametrized, you can repeat the whole Kartotrak workflow in just a few clicks. You can implement Kartotrak on-site for real-time data acquisition or at the office for in-depth analysis including risk management studies and setup of excavation plans. Kartotrak provides efficient tools for sampling optimization and risk assessment, enabling you to better anticipate hazards during remediation and consequently to better estimate the project costs. You can control key uncertainties related to contaminated volumes or pollutant masses and identify areas that are either sub-sampled or with an increased heterogeneity. Kartotrak 2D/3D mapping functionalities allow you assessing efficiently the soil compatibility with the site’s future use or its surrounding environment. Kartotrak facilitates communication between stakeholders thanks to its 2D/3D visualization components, therefore providing you with strong basis to your decision process. Tauw France aims at supporting remediation solutions for customers and the public administration. To fulfill this objective, the consulting firm relies on Kartotrak.one for the visualization of the environmental data and geostatistical modeling. CEA LASE has developed the Digital Autoradiography technique to obtain images of radionuclides that can be found in nuclear wastes and are difficult to measure. Kartotrak is used to process the large datasets that derive from it and produce accurate maps of radionuclides. Dekra Industrial France uses Kartotrak to get the accurate and reliable contamination maps they need to quickly locate hot spots. By doing that, they quantify the level of uncertainty attached to contaminated volumes, which helps them secure their remediation budget..
Geovariances has developped a dedicated geostatistics-based library which is part of ISYmap's GLOBall, a revolutionary system allowing remoted and fast dose rate measurement and mapping, easy and quick to set up by operators staying far from hazard area in safe conditions. 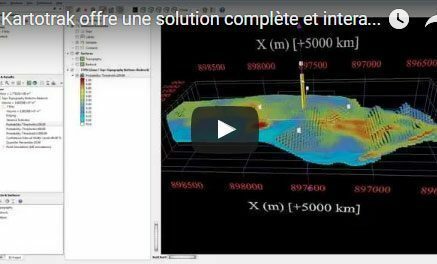 Kartotrak allows consolidating diagnosis data, visualizing data in 3D and evaluating the areas that present the greatest uncertainty in the results, which guides us for refining our estimates of volumes of impacted soils. "In the final dismantling stage of ​Zorita nuclear plant, Geostatistics and Kartotrak take an important relevance in the project inside the Site Release process." Kartotrak permet de réaliser rapidement l’analyse des données de pollution et de générer des visualisations graphiques et rendus professionnels. Le logiciel améliore la compréhension du fonctionnement d’un site pollué et nous aide à dimensionner des solutions de gestion. When using a "sniffing truck" with MIP probes to search for pollutions by volatile organic pollutants, thousands of data are collected. With Kartotrak, the management of all these data becomes a childlike simplicity and the graphical representations of results more relevant. Attend the talk from our expert and discover how to optimize sampling for initial nuclear site characterization. Kartotrak | How confident are you with your management plan quality? 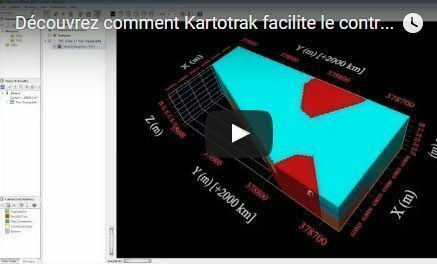 Kartotrak | Etes-vous sûr de la qualité de vos plans de gestion ? How confident are you with your site management plan quality? 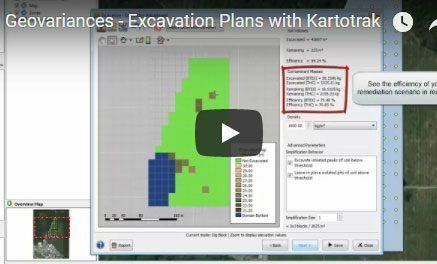 Kartotrak provides a sound and objective base to generate reliable excavation plans, letting you compare the efficiency of different remediation scenarii, thus paving the way to much better remediation management. Find out how watching this step by step demo video. Kartotrak adds value to your data and provides an increased reliability to your conceptual site model. Thanks to efficient tools Kartotrak helps you to lead a preliminary control ensuring the reliability required to the characterization project. 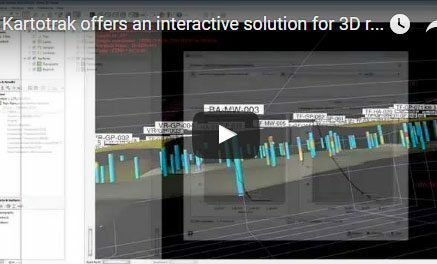 Grâce aux différents outils fournis dans son visualiseur 3D, Kartotrak offre une solution complète et interactive de rendu 3D. Cette vision 3D de la contamination dans son contexte environnemental aide à anticiper le plan de gestion des terres à excaver. Aussi, Kartotrak facilite l’extraction de plans 2D en lien direct avec les futurs travaux de dépollution. Kartotrak présente ainsi un véritable outil opérationnel de visualisation des données et d’aide à la décision, offrant un support de communication interactif lors de présentations. Before starting an evaluation of the contamination leading to decision-making tools for site clean-up, it is essential to ensure data quality. Thus, based on solid and reliable foundations, uncertainties occurring during the different steps of the decision process will be better controlled and the final quality of the project improved. The objective of this white paper is to assess at best the validity of the data through visual, statistical and geostatistical basic tools before going further into their analysis. The objective of any serious mapping is to obtain a realistic and reliable image of the studied phenomenon. Concerning dose rate, maps are often derived from punctual measurements interpolated using deterministic methods. Sometimes, the choice of the inverse distance squared weighted interpolation is wrongly justified by the fact that the dose rate issued from a punctual source is theoretically inversely proportional to the squared distance between the source and the measurement point. Through this white paper, find out why this inverse distance squared weighted interpolation is not the appropriate method for dose rate mapping and why the geostatistical approach by kriging is the solution for a quality and reliable mapping.